It’s time to explore a familiar world with an unfamiliar set of characters in Manga Entertainment UK’s Blu-Ray release of The Ancient Magus Bride – Part 1. What can one expect from this particular release? Let’s take a look and find out. Suffering a tragic childhood, Chise Hatori has lost all hope for happiness until a mysterious mage named Elias takes interest in her aptitude for magic. To survive, she must learn to wield her powers while Elias must learn what it means to be human. Unaware of what lies ahead, he decides to make her his apprentice—and his bride. Based on the dark fantasy Shonen Manga of the same name, The Ancient Magus Bride, or as I originally called it The Ancient Magnus Bride, is a twisted story of deception, magic and mystical beings in a world that should resonate with those that enjoyed the Harry Potter franchise. Truth be told this is a unique story; but the similarities of feeling unwanted and thrown into the magic world – within Great Britain I might add – are frighteningly the same. Regardless of these similarities the events of this first half of season one will provide an introduction to this world and as fun as that may be the events found within these twelve episodes are just as emotionless as the main characters representing the story. Containing twelve episodes across two Blu-Ray discs and presented in both English and Japanese (with removal subtitles I might add) The Ancient Magus Bride – Part 1 tells the story of the unlikely partnership between fifteen-year-old Chise Hatori and the mysterious mage Elias. It’s a story that begins in the ‘strangest’ of places with Chise, who having been abandoned by her parents and relatives, finds herself being sold off an underground auction of mages. It sounds sinister and evil; but the truth of this auction is far from dark ulterior motives – as Chise is actually a Sleigh beggy – a special human who wields strong magical abilities and has the ability to see spirits and creatures lurking within the world. 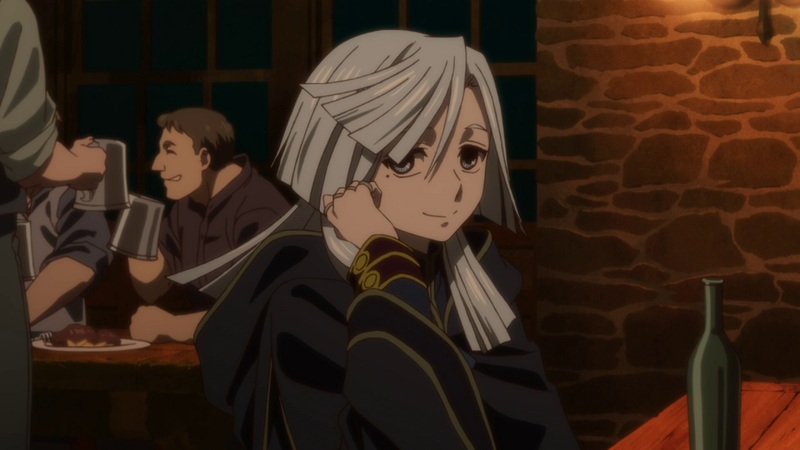 Regardless Elias takes interest and ends up purchasing Chise for an unimaginable amount with the prospect of making her his apprentice and in turn bride. Alas it is here where the journey of Elias and Chise begin – both of whom are devoid of any kind of emotional appearance. For Elias it is because he is a mysterious creature, with a skull for a face, and for Chise her emotional trauma of her family abandoning her results in keeping her emotions to herself and not being attached to anyone. This ‘emotional’ disconnect continues throughout this first half with the introduction of Silver, the landlady of Elias residence, and Ruth, a wandering spirit turned familiar, who also show no signs of emoton other than the typical anime stare when relevant. If you are looking for happy-magical-thrills then you won’t find it here; but it does offer a steadily progressing story that takes its time to find its feet. Even though The Ancient Magus Bride is a relatively short series, with twenty-four in this first season and a second season planned for late-2019, the progression is slow and steady. It’s possible this is the help highlight Chise and her emotional detached from the world; but in retrospect its to allow viewers to become attached to this mysterious creatures and spirits that Chise and Elias encounter. As an example during this tweleve episode selection Elias and Chise take on requests for the local church, most of which see them resolve spirit related attacks, explore the land of the dragons and learn the ways of being a mage. All the time Chise’s emotionally state begins to open up to that of a normal carefree girl. That’s not all as upon receiving her magic wand (more of a staff really) Chise learns more about Elias’s past and the mysterious that surrounds him while elsewhere potential threats and dangers loom for Chise and Elias for those that want Chise and her unique powers for themselves. It’s a slow start to what could be an interesting series; but the vibe around this particular series offers the same type of experience received from within Snow White and the Red Hair. It’s an oddly familiar story with a slight twist; but at the same time not exactly memorable but well worth a watch. Strange isn’t it? But wait there is more. 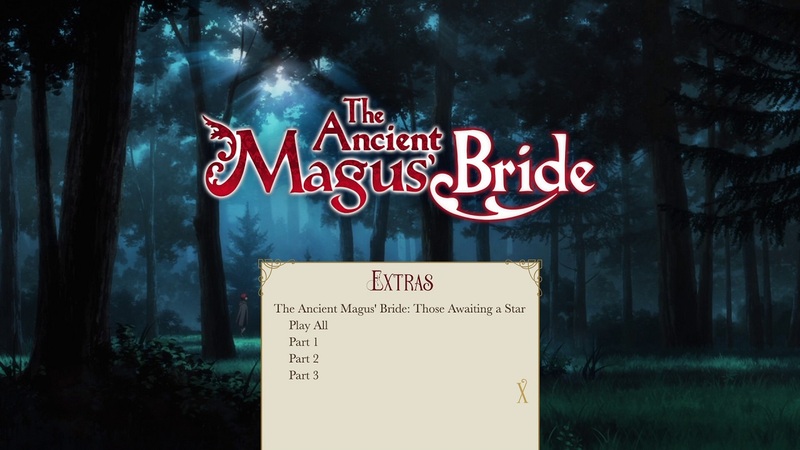 Included as a bonus feature on this Season 1 Part 1 release of The Ancient Magus Bride is three OVA styled episodes, known as The Ancient Magus Bride: Those Awaiting a Star, that highlights Chise’s difficulties as a child and her first experience of encountering a mage. It’s an interesting story, and acts more like a film, but it further explores the world in which these characters inhabit. Sadly unlike the series itself this story is only presented in Japanese with English subtitles; an odd decision but this could be as a result of a decision from the Japanese licensor (as explained before the main menu appears). The Ancient Magnus Bride – Part 1 offers a limited, but wide-variety, of supplementary with bonus features including the 3-Part OVA series The Ancient Magus Bride: Those Awaiting a Star as well English Produced content in the form of Cast Commentary and Q&A Sessions with the FUNimation Twitter community.It is a refreshing selection of content, especially when compared with the usual inclusions of textless opening and ending segments, and further extends the viewing time one would expect from a series such as this. The three-part OVA Series, The Ancient Magus Bride: Those Awaiting a Star, is an obvious highlight of the bonus features on Disc 1 as it explores Chise’s past in greater detail; but sadly it is only presented in Japanese with English Subtitles. An odd decision perhaps but at least it is included on this Part 1 release as it could have easily been released as a separate piece of content. For instance The total run-time of the three episodes combined is longer than most Drgaon Ball Z films. This particular story sees Chise receive a package from an acquaintance of Elias and inside this package she discovers a book that she used to read as a child and with it the memories it brings. This sparks a discussion within the household and it leads Chise to disclose her first encounter of a mage in the forest as well as the difficulties she had growing up and adapting to people. It’s a great story; but sadly it must not be watched until after the events of this Part 1 release; otherwise it will spoil the introduction of certain characters. The remaining selection of bonus content meanwhile, which can be found on the Secon Disc of this Part 1 release, is the usual selection of content you would come to expect from a FUNimation produced release. 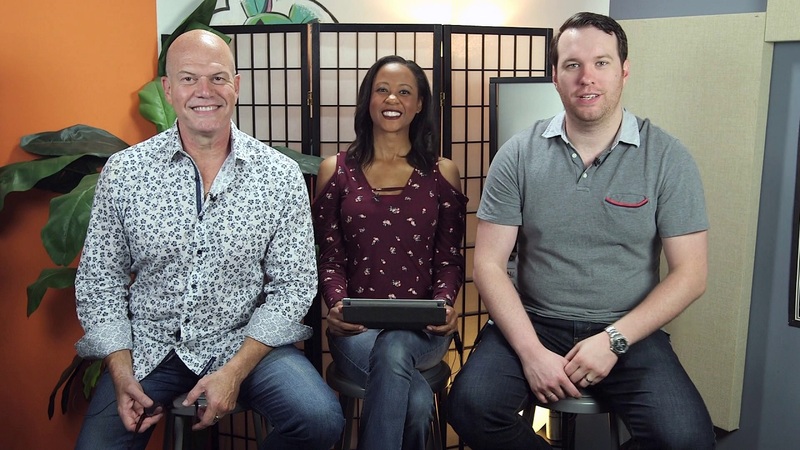 In this case the English Cast Commentary (for Episode 8) sees notable characters from this episode provide an insight on working with the series, their experiences with the show and what they thought of the series. The Twitter Q&A meanwhile sees the fans asking the questions via social media with voice cast and directors providing answers to those questions. Two insightful, an interesting, features indeed; and an ideal watch for anyone who enjoys the English Dub of The Ancient Magus Bride. The Ancient Magus Bride – Part 1 acts as an introduction to this uniquely familiar world of magic and spirits, with the series itself taking place in a fictional variation of the UK, and the characters that reside with it; but despite all of this mysterious wonder it is neither exciting nor magical. The content of each episode moves along at a snail’s pace and while I found myself relatively bored by the events of each episode I could not help but carry on watching it unfold. Of course the further you progress the more things unravel; but it still doesn’t fit within the trend of being exciting viewing experience. It’s simply watching these characters personalities unfold and be explored on screen; but in most cases you don’t actually see it happen and it changes swiftly in between each episode. 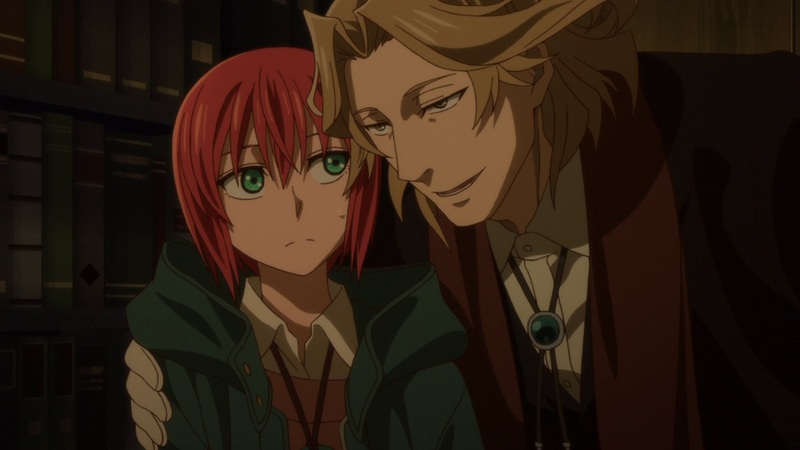 In this case Elias purchases Chise from an underground magic auction house under the pretence of turning Chise into his apprentice as well as his bride. 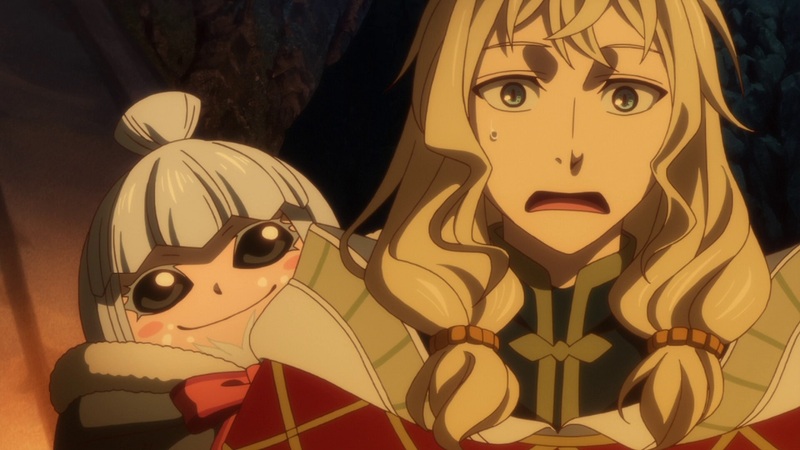 Throughout the remaining episodes Elias, along with acquaintances across the globe, teaches (off screen) Chise what it means to be a mage and through the course of different requests from the Church she is able to demonstrate her abilities. It’s soon explained that Chise is actually a Sleigh Beggy, a human with abnormal magic power that will die at a young age, and that Elias purchased her as an experiment in order to prolong her death. Surrounding this ‘mage acquaintance’ storyline we have Elias first encounter with Lindel (who watches over the Dragons) and a enemy threat in the form of Cartaphilius. 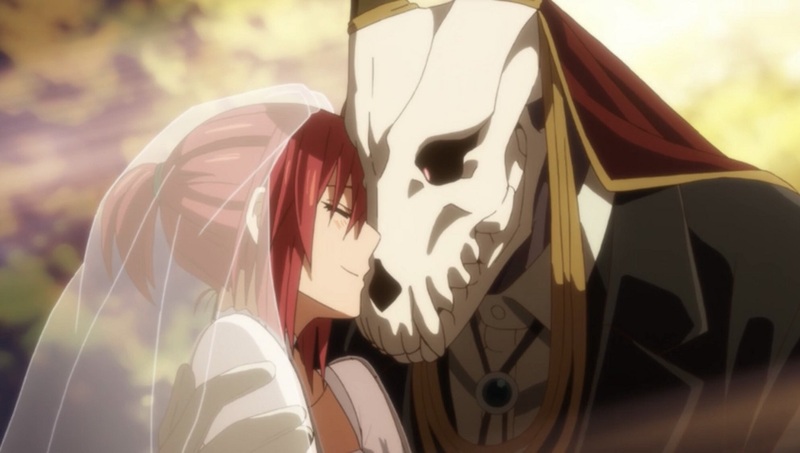 Deception and twisted desires potential reside within The Ancient Magus Bride – Part 1 but for the most part it is a long-winded and dreary introduction that sees Elias and Chise accepting requests from the Church. This relatively mundane approach to storytelling isn’t helped by the English voice cast but while this may sound negative it’s actually a positive. Majority of the main characters within The Ancient Magus Bride (i.e. 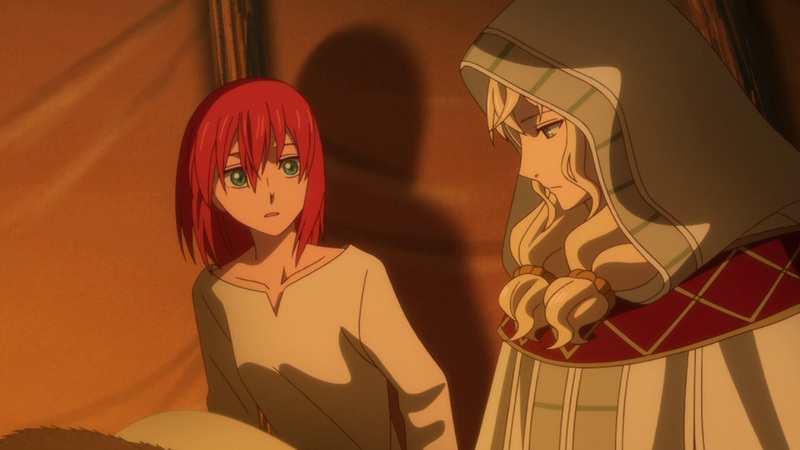 Elias, Chise, Silver, Ruth) demonstrate very little emotion throughout the twelve episodes included and the English Voice Cast retain this emotionless state in their dialogue. They deliver a more believable representation of the characters; sadly in scenes which sees the characters acting happy it does not transcend well. 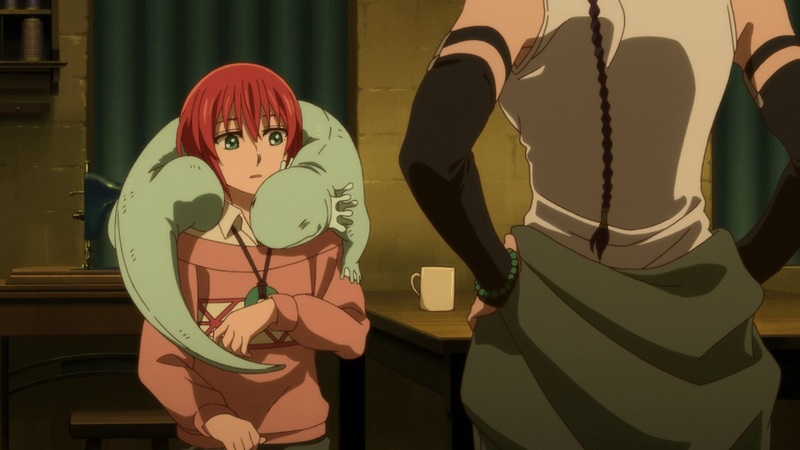 Dani Chambers (English voice of Chise) and Brian Mathis (English voice of Elias) do great jobs of representing the characters but at the same time they don’t feel like the right voices for the characters they are portraying. The Japanese voice-over meanwhile does feel better (especially Ryota Takeuchi as Elias) but at the same time can almost feel a bit too chipper. Originally I started watching The Ancient Magus Bride in English but I eventually restarted watching in Japanese as it felt like it delivered a more enjoyable experience; but alas both audio options are decent enough to deliver the story that is being told. Overall I found The Ancient Magus Bride – Part 1 to be a bit of a ‘hit and miss’ type of series; this Blu-Ray release offers everything you could want from the first half of the season (and is based on FUNimation’s Blu-Ray Disc Master) with strong selection of supplementary content, removable subtitles and consistent picture quality but I did not wholeheartedly enjoy the story the was being told as it seemingly does not go anywhere. Sure enough this is only half of the series and the second half looks to be more promising. If you enjoyed shows like Yona of the Dawn and Snow White with the Red Hair then The Ancient Magus Bride is worth checking out; as it offers that same type of vibe. Interesting characters, but disappointing story lines. The Ancient Magus Bride – Part 1 will be available on Blu-Ray and DVD from the 1st April 2019 via Manga Entertainment UK.